The historic town of Duvall is full of interesting stories. Moving the town, to bailing out graves, to tavern won in a poker game. Our self-guided tour of downtown Duvall is a fun way to learn about historic buildings and the stories they have to share. Click on the links for each of the stops to see historic photos. Itinerary designed with generous support from 4Culture King County Lodging Tax. Start your day at Depot Park. The public parking lot is a great place to leave your vehicle while you enjoy your walk. If you need a snack or hot beverage before you start you can head up the hill one block to Main Street where you’ll find an array of coffeshops and cafes. The first stop is at the Duvall’s Historic Railroad Depot located immediately downhill from the parking lot. The historic railroad depot was built in 1911 and was originally located next to the river where it sat right to the railroad tracks. It was donated to the City of Duvall in 2001 by its owner, Ray Burhen, and moved to its current spot in Depot Park in order to preserve it for the public’s enjoyment . It is now used as a community meeting space. Head down the trail to the Snoqualmie Valley Trail and take a right (heading north). This trail was originally the rail line for the Chicago, Milwaukee and St. Paul. However in the 1960’s, due to the rise of automobiles and challenging government regulations, the railroad, like many others across the country abandoned it’s rails. You can read more about the influence of railroads in Duvall and the Snoqualime Valley in our blog How the Railroad Built Duvall. In 1980’s King County Parks acquired the rail line through the Snoqualmie Valley and converted it to the Snoqualmie Valley Trail. The Snoqualmie Valley Trail is the single longest trail in King County’s Regional Trail System. At 31 miles long, it runs from Duvall to Rattlesnake Lake where it connects into the Palouse to Cascade State Park Trail that runs to Eastern Washington. The future vision is a connection to the Centennial Trail through Monroe and Snohomish. Continue walking north along the Snoqualmie Valley Trail for about 800 feet. You’ll cross under the Woodinville-Duvall Road and arrive at Taylor’s Landing Park. The original town of Duvall was named Cherry Valley and was situated on the banks of the Snoqualmie River right around the current day Taylor Landing Park. The community of Cherry Valley was centered around a market, grange hall, church, and a school (which had been constructed from the wood of a single old growth log). It was mostly isolated from the larger Seattle-Tacoma region, relying on boats as the main mode of transportation for timber, farm goods, and people. A swing bridge was installed in 1905 to connect the Woodinville area to the river. The railroad line was being constructed right along the river, both from the north and from the south, and was headed to right where the town of Cherry Valley was located. So when the Great Northern and Chicago, Milwaukee and St. Paul railroad was constructed, the town had to be moved. The railroad helped move homes and businesses up the hill to their present location. For a short period of time the new town was named Cosgrove (after a Washington governor) until they discovered another Washington town had already claimed the name. 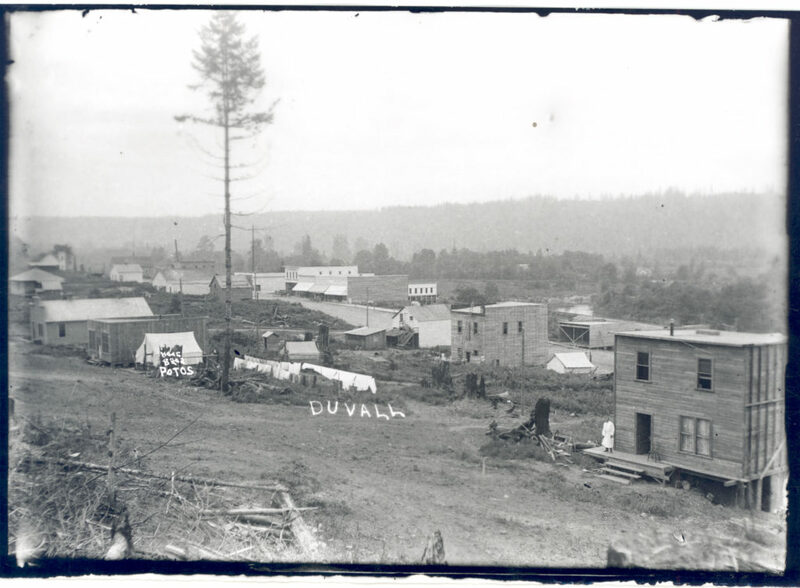 The new, new name, Duvall, was given to the town in honor Francis and James Duvall, loggers who had a homestead the hillside when they arrived in 1871. From Taylor Landing Park head east towards Highway 203. Cross over Highway 203 and head north towards Cherry Valley Road. Head up the hill about 600 ft to where the road bends to the right. On the northwest side of the road you’ll find the Cherry Valley Pioneer Cemetery. This cemetery was the original cemetery for Cherry Valley. It was part of an acre that was deeded in 1886 James O’Leary, the original homesteader, to the Squak Methodist Mission for a church and cemetery. The half acre cemetery behind the church was used by Duvall’s early pioneers, but only for a few short years because natural springs from the upper slopes kept the ground constantly wet and soggy. It was disconcerting for mourners to see gravediggers furiously bailing several inches of water before lowering the casket so the site was abandoned as a burial place ground sometime between 1902 and 1905. To further complicate things, part of it had to be excavated by the railroad in 1909 and 1910. A portion of the hillside was in the way of the railroad right-of-way. The Great Northern Railroad had to move about 20 bodies to other cemeteries during the process. You can read more about the cemetery here. Continue heading east on Cherry Valley Road to the adjacent Dougherty Farmstead. The homestead that would become this farmstead was originally purchased in 1886 by James O’Leary. The Dougherty house was originally built near the river in the town of Cherry Valley. It was moved up the hill in 1910, pulled by horses. In 1898 John and Kate Dougherty bought the house and their family lived there until 1983 when Leo Dougherty died. With a grant from King County, the Duvall Historical Society started working on preserving the house in 1985. The house has immense historic integrity as a 19th century farmhouse since it wasn’t altered in the previous 100 years. It still had its original walls, doors, windows, woodwork, staircase, and exterior siding. In addition to the house, the property also includes the milk house and the bunkhouse where Kate Dougherty, then a widow with eight children, boarded eight loggers. One acre of the Dougherty farmstead including the house is both a King County and National Landmark. You can go inside the house during the designated open house events that happen every Sunday 1pm to 4pm from May through September. You can also request a tour by appointment by contacting webmaster@duvallhistoricalsociety.org. Now we’ll head back to main street. Go back down Cherry Valley Road to Highway 203. Stay on the eastern side of the highway and head south towards downtown. As you approach Stewart Street you’ll see the Duvall Tavern across the road. This Tavern was built in 1934, just a year after prohibition and has stayed in operation ever since. The south parking lot used to be the ramp to the old Stewart Street Bridge across the Snoqualmie River to Woodinville. In 1963, The Duvall Tavern was bought and sold three times in two days. It was won in a poker game by a well-known gambler in the Valley who then sold it to another gambler to pay off his gambling debt. That person then sold it to another person who wanted to be in the business. After crossing over SE Stewart Street you’ll arrive at Lon Brown’s home (1914). This historic home was built in 1914. Brown was the first mayor of Duvall. He was a colorful entrepreneur who ran the silent movie theater and the confectionary across the street. It has since housed Trim’s Meats and Cherry Valley Plumbing. The building currently houses EarthHeat Geothermal Energy Systems. Just next door you’ll find Aimer’s Blacksmith Shop (1913) (later L.D. Smith Blacksmith Shop).This shop was built in 1909 when the town had its short-lived time being named Cosgrove. The business was sold to L.D. Smith in 1913. Here, horseshoes were fashioned and farm equipment repaired. Later it was developed into a gymnasium then an art shack. It currently houses Bella Couture Parlor. Continue next door to Red Pepper Pizzeria. Originally Hoffman’s Duvall Tailoring Co. (1911 or 1912), it was built in 1911 or 1912. Mr. Hoffman hiked out to logging camps, taking orders and measurements for some real classy suits. The customers would then drop in on Saturday night for a final fitting. It also served as the original Silver Spoon Restaurant, barbershop, antique shop, and arcade. The next building, currently Duvall Flower and Gifts, is the oldest building in town, built in 1905 it housed Hix’s General Merchandise (1905). It was originally built on the river in the town of Cherry Valley and was moved to its current location in 1910 when the railroad laid out tracks that would have come through the front door and out the back. Its owner, Arthur Hix, decided that even with the excellent shipping facilities they would afford, he would prefer to move. It took six weeks to get it to its present location. It served as a general store and Post Office and later as Duvall Auto Parts. Cross over Cherry St to head to Studio Beju. This building was originally the Duvall State Bank (1912), built in 1912 and later Bank of America. It was robbed of $435 in 1915 who by three men with pistols blazing and one man acting as lookout. As the robbery was noticed by nearby citizens and the town marshal, the citizenry was aroused and a gun battle ensued with shots fired from every direction. The leader of the robbers, with loot in a pillowcase, headed for the river. Shots continued to ring out and a splash was heard. The pillow case containing the gold and an empty pistol were all that were found. Just next door is the Grateful Bread. Built in 1913, it was originally Franke’s Shoe Store (1913) where Joseph Franke made shoes (including the caulked boots for loggers) and also repaired them. Later, the building served as the office of Judge Wright, the father of the Broadway star, Martha Wright. Later still, it served as the home of the Carnavall Reporter newspaper, a florist shop, the Pumps and Grinds Coffee Shop, and the Duvall Coffeehouse. Head back north to Cherry Street and cross west to the other side of Highway 203 where you’ll find the Pacific Bike and Ski Shop. Originally Boyd’s Grocery (1912), this building was already in operation in 1912, and contained a grocery store as well as a bakery and Post Office. In the 1930’s the bakery was converted to cold storage lockers. It was later Stretch’s, then McDougal’s General Store. Later, it was home to the quirky Duvall Book Store, which closed in 2016. The Duvall Book Store attracted visitors from afar, not only for its quality collection of used books, but as a cultural attraction that included displays of historic and eclectic memorabilia in an old-fashioned atmosphere with neither telephone nor cash register. Head south to the next building, the Duvall Visitor’s Center. This building was originally the Duvall Library (1930s) and was built in the 1930s with WPA (Works Progress Administration) money and first operated by the Duvall Civic Club. The first books were donated by members of the club and those purchased on a shopping trip to Seattle. Next door you’ll find The Grange. Originally known as the Oddfellow’s Hall (1909), it was built in 1909 on the river, and was moved by the railroad to its current location in 1910. The IOOF Duvall Lodge #311 was set-up in November 1914. The building was the social center of the town. Klondike Days, a big local event, was held in the building. In 1977 it became the famous Silver Spoon, serving up delicious arts and crafts as well as fine food and amazing live music upstairs after dinner. Local artists sold pottery and art throughout the dining room where customers sat at tables covered with vintage strawberries, violets, poinsettias and state maps. Continue one block south to Stephens St and take a right to get back to your car. You can also take a few minutes to hang out by the river at McCormick Park and contemplate all the stories of times past.